Catholic News World : #PopeFrancis ask yourself "Is this new thing from the Lord, does it come from the Holy Spirit, is it rooted in God?" #PopeFrancis ask yourself "Is this new thing from the Lord, does it come from the Holy Spirit, is it rooted in God?" (Vatican Radio) Cultural and ideological colonization does not tolerate differences and makes everything the same, resulting in the persecution even of believers. 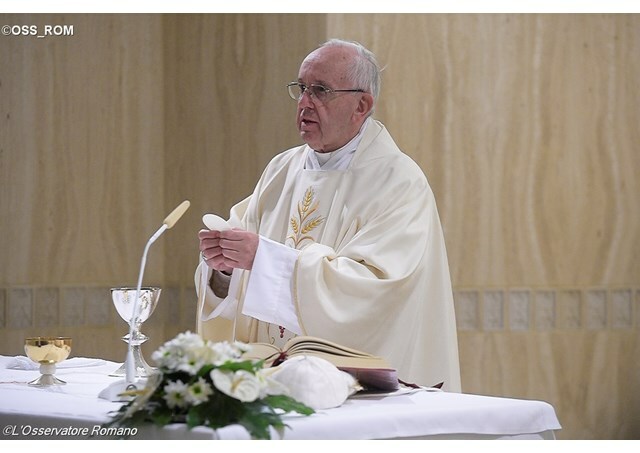 Those were Pope Francis’ reflections in his homily morning Mass at Casa Santa Marta, which centered on the martyrdom of Eleazar, narrated in the book of Maccabees from the First Reading (Maccabees 6: 18-31). The Pope noted that there are three main types of persecution: a purely religious persecution; a “mixed” persecution that has both religious and political motivations, like the Thirty Years War or the St. Bartholomew’s Day Massacre”; and a kind of cultural persecution, when a new culture comes in wanting “to make everything new and to make a clean break with everything: the cultures, the laws and the religions of a people.” It is this last type of persecution that led to the martyrdom of Eleazar. The account of this persecution began in the reading from Monday’s liturgy. Some of the Jewish people, seeing the power and the magnificent beauty of Antiochus Ephiphanes (a Greek king of the Seleucid Empire), wanted to make an alliance with him. They wanted to be up-to-date and modern, and so they approached the king and asked him to allow them “to introduce the pagan institutions of other nations” among their own people. Not necessarily the ideas or gods of those nations, the Pope noted, but the institutions. In this way, this people brought in a new culture, “new institutions” in order to make a clean break with everything: their “culture, religion, law.” This modernizing, this renewal of everything, the Pope emphasized, is a true ideological colonization that wanted to impose on the people of Israel “this unique practice,” according to which everything was done in a particular way, and there was no freedom for other things. Some people accepted it because it seemed good to be like the others; and so the traditions were left aside, and the people begin to live in a different way. But to defend the “true traditions” of the people, a resistance rose up, like that of Eleazar, who was very dignified, and respected by all. The book of Maccabees, the Pope said, tells the story of these martyrs, these heroes. A persecution born of ideological colonization always proceeds in the same way: destroying, attempting to make everyone the same. Such persecutions are incapable of tolerating differences. “And this is the path of cultural colonization that ends up persecuting believers too. But we do not have to go too far to see some examples: we think of the genocides of the last century, which was a new cultural thing: [Trying to make] everyone equal; [so that] there is no place for differences, there is no place for others, there is no place for God. It is the perverse root. Faced with this cultural colonization, which arises from the perversity of an ideological root, Eleazar himself has become [a contrary] root. “Ideological and cultural colonizations only look to the present; they deny the past, and do not look to the future. They live in the moment, not in time, and so they can’t promise us anything. And with this attitude of making everyone equal and cancelling out differences, they commit, they make an particularly ugly blasphemy against God the Creator. Every time a cultural and ideological colonization comes along, it sins against God the Creator because it wants to change Creation as it was made by Him. And against this fact that has occurred so often in history, there is only one medicine: bearing witness; that is, martyrdom.